August 1984. I was headed to my Sophomore year in High School. We joked about "1984" all year. Yeah, no so damn funny now is it. "Ghostbusters" and Prince dominate both the Box Office and the Billboard charts. I was getting ready to start a two-year long campaign that would change my game world forever. Ok, maybe that last one doesn't quite have the World-changing power of Ghostbusters or Purple Rain, but hey it was my world. 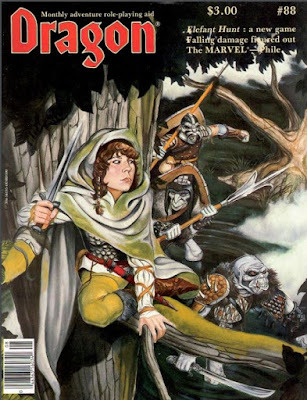 So let's sit back, put on "When Doves Cry" and join me for Issue #88 of This Old Dragon. Dragon issue #88 is the first Dragon I didn't buy. What's that mean? Well, I had been buying Dragons now since issue #83 and was pretty set on getting each one. Issue #88 was the first one I didn't get after my first run. It was the first chose not to buy. Much to my later chagrin when my DM opted to buy it! I am mixed about this cover. I think the orcs look cool, but it just doesn't grab me to be honest. At this point I should state that this copy I have is in near mint condition. I know it was not part of the boxes I picked up off of Craiglist or even one of my own originals. This one is a bit of mystery to me as to why it is in such great and complete shape. Letters section covers a number of "What is Official" type of questions. I used to worry about such things myself. I used to imagine that D&D Conventions were a bit like the big Boy Scout meetings I had gone too before I left (or was kicked out of) the Boy Scouts (we had serious fundamental philosophical differences). But no one has ever in any official capacity looked over my shoulder to tell me I was "doing it wrong". Lots of amateurs sure, but I cheerfully dismissed them. Len Lakofka is up first with the next part of Gods of the Suel pantheon. Here we get Syrul, Fortubo, and Wee Jas the unrequited love of my life (circa age 14). Wee Jas, of course, grabbed my attention like nothing else in this issue. She was a gorgeous goddess of magic known as the Witch Queen? How in the hell was I supposed to ignore that? For years I thought this art was a Larry Elmore piece, but it is actually Jeff Butler. I think the wide eyes are what really sets this piece off. Bella Donna indeed. Also, have a look at her name "Wee Jas" or "Wee" and "Ja" or "Oui Ja". She is the goddess of the Ouija board as well. Magic. Death and Spirits. Clever Gary. I really enjoyed the Suel mythos and history. 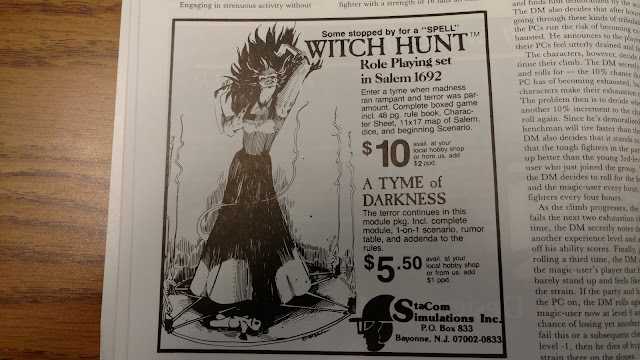 I always wanted to run a game set during the last days of the Suel Empire going right up to the Invoked Devastation and the Rain of Colorless Fire. In my game of the time my world (Mystara) merged with my DM's world (Oerth). I figured that there were so many different cultures in such a small space because they were all refugees of the fall of the Suel Empire. There is a lot really. Arn Ashleigh Parker is back with Physics and Falling Damage. Wow this article and the next one, Kinetic Energy is the Key by Steven Winter, lit up the letters and Forum pages for many issues to come. We even talked about this in school. In the end we all decided that it was not worth the effort. We never read a fantasy story where the hero died in a fall. They died from sword wounds, spells or a dragons' bite. A d6 every 10 ft. works. Though if I were to get slightly more scientific then I would say a die type for each size category. So something Small or smaller uses a d4, Medium and Large a d6, larger categories go up to d8, d10 and d12. sure they all fall at the same speed (acceleration due to gravity) but their different masses produce different force when hitting the ground. Ed Greenwood is up with the Ecology of the Rust Monster. Little bastards. Off the Shelf needs to be recognized this time if for no other reason than their inclusion of a review for William Gibbson's Neuromancer. We had no idea, even in ominous 1984, that we were getting a glimpse, however fuzzy, of the future. Not just a future in terms of Cyberpunk, but in terms of the future we live in now. At some point Neuromancer is going to read like the Golden Age of Sci-fi looks to us now. Katharine Kerr is back with more Beyond the Dungeon. She discusses moving the game the great outdoors. For me this was covered rather nicely in the D&D Expert set. 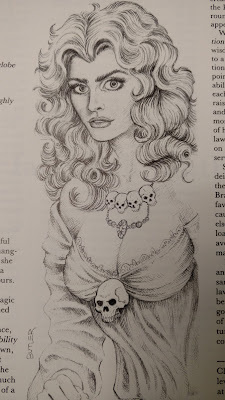 There is a part of this article that does provide a lot of use and that is the introduction of a simple skill system to the *D&D game. Actually, it is more of a skill philosophy than full on system. 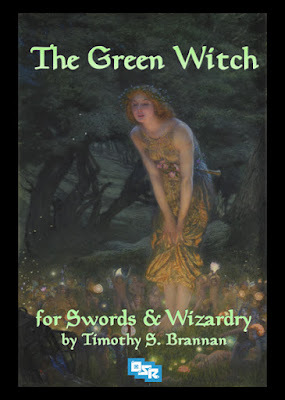 This makes it a good choice for any modern D&D too, since the ideas can be used even when there are skills. 4e did a little of this too. Yes, I had Witch Hunt but I never had that 10th Anniversary boxed set. At the time I figured I didn't need it since I had most of those books. Now I am kind of kicking myself. Did anyone have it? I never see them on eBay or anywhere else for that matter. You can sure as hell believe that come 2024 I'll whatever WotC slaps a 50th Anniversary label on. 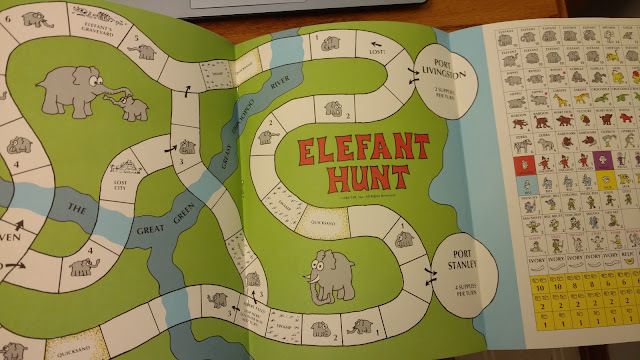 The "centerfold" is the crazy "Elefant Hunt" game by Tom Wham. I played it once I think. I have vague memory of it anyway. ICE Can Stand the Heat covers books from Iron Crown Enterprise's Rolemaster series, or as we use to call it "Chartmaster". I kinda liked "Spell Law" but it didn't fit with what I was doing at the time so I never used it. My loss in some cases I think. The Ares Section starts of with Gamma World and a timeline of the future in Before the Dark Years. Spoiler. That's us. According to the timeline 2003 to 2021 is a time of ecological and economic disaster in America and Europe. It still has the Soviet Union around, but you can't fault them on that. We used this timeline a lot for our own D&D-mixed-with-Gamma World game. Re-reading it now I see a lot of ideas I still use. The Marvel Phile is intact and features Thor, Loki and Ulik leader of the Lost Trolls. Odd, I don't remember him in the movie. The Battle of Ebony Eyes is a ready-to-run Star Frontiers: Knight Hawks adventure. Followed by two more Star Frontiers articles. Ads, comics, another fairly forgettable Talanalan, Worrmy, and Snarf Quest with the introduction of VR-X9-4-M2 also know as Aveeare. So. A really fun issue and in surprisingly great shape. Wanna see what I said about White Dwarf from the same time? Click here for White Dwarf #56. Like what I do here? Pick up a copy of my newest book, The Green Witch! I figured that, as Gary Gygax loved puns, Wee Jas was a pun. More correctly, I thought her name was an anti-pun of "Hugh Jas." I am really enjoying these walks through Dragon magazine. Most of them I acquired via the CD archive about 10 years ago but this is one I saw in the flesh back in the day and still own myself. Happy Gary Gygax Day, Tim! I hope to celebrate with some S&W Light tonight with the little guy and my wife, but we have to grocery shop first. D-: Here's hoping I have energy upon our return home. I loved this cover and it was one of my faves. 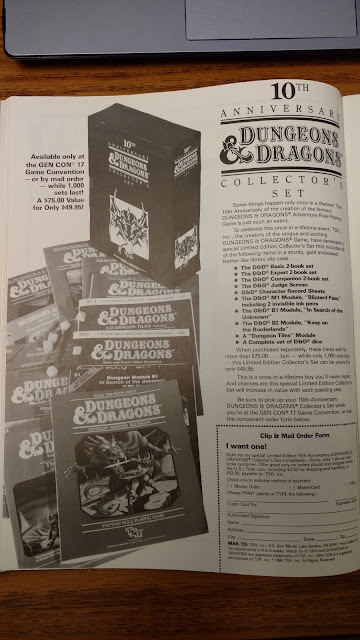 A Kerr article pretty much guaranteed I'd pick up an issue, and including a Star Frontiers adventure would have clinched it (though I don't remember ever running this one). Sheesh, it is amazing how good that Wee Jas picture is. if I had seen this Dragon, I would have made a dozen worshippers of her as Player Characters. Go Jeff Butler! The falling rules crack me up. In high school, I was unbearable as a GM in my superhero campaign because I was taking Physics at the time and approached every question about falling or velocity as a chance to break out some formulas. Wee Jas = Ouija. I should have gotten that, but until now it eluded me. That Holloway cover decided what orcs looked like in my games. Always enjoyed Jim Holloway's depictions of orcs and dwarves, pretty much anything really. His work has an simple but animated style that reminds me of storyboards.